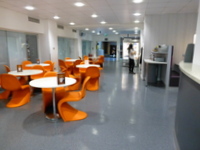 Services / facilities within the building include the Department of Management; the Information Services Centre; the London Dental Education Centre; the Vascular Biology Group; Nutritional Sciences Division - Department of Nutrition and Dietetics; Pharmaceutical Science Division - Department of Pharmacy, Department of Forensic Science and Drug Monitoring; the food court; Le Cafe and Graduate Lounge; the Chaplaincy; Muslim Prayer Rooms. Related link Library opening times. To view the DisabledGo access guide for WAT/F-WBB.5 please click here (new tab). To view the DisabledGo access guide for WAT/F-WB1.10 please click here (new tab). To view the DisabledGo access guide for WAT/F-WB1.11 please click here (new tab). To view the DisabledGo access guide for WAT/F-WB1.12 please click here (new tab). To view the DisabledGo access guide for WAT/F-WB1.13 please click here (new tab). To view the DisabledGo access guide for WAT/F-WB1.14 please click here (new tab). To view the DisabledGo access guide for WAT/F-WB1.16 please click here (new tab). To view the DisabledGo access guide for WAT/F-WB1.17 please click here (new tab). To view the DisabledGo access guide for WAT/F-WB1.20 please click here (new tab). To view the DisabledGo access guide for WAT/F-WB1.21 please click here (new tab). To view the DisabledGo access guide for WAT/F-WB1.60 please click here (new tab). To view the DisabledGo access guide for WAT/F-WB4.178 - First Aid and Parenting Room please click here (new tab). To view the DisabledGo access guide for WAT/F-WB1.61 please click here (new tab). To view the DisabledGo access guide for WAT/F-WB1.62 please click here (new tab). To view the DisabledGo access guide for WAT/F-WB1.63 please click here (new tab). To view the DisabledGo access guide for WAT/F-WB1.65 please click here (new tab). To view the DisabledGo access guide for WAT/F-WB1.67 please click here (new tab). To view the DisabledGo access guide for WAT/F-WB1.69 please click here (new tab). To view the DisabledGo access guide for WAT/F-WB1.70 please click here (new tab). To view the DisabledGo access guide for WAT/F-WB1.71 please click here (new tab). To view the DisabledGo access guide for WAT/F-WB2.40 please click here (new tab). To view the DisabledGo access guide for WAT/F-WB2.41 please click here (new tab). To view the DisabledGo access guide for WAT/F-WB2.42 please click here (new tab). To view the DisabledGo access guide for WAT/F-WB2.43 please click here (new tab). 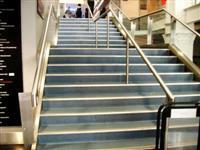 To view the DisabledGo access guide for WAT/F-WB2.44 please click here (new tab). To view the DisabledGo access guide for WAT/F-WB2.45 please click here (new tab). To view the DisabledGo access guide for WAT/F-WB2.46 please click here (new tab). To view the DisabledGo access guide for WAT/F-WB2.47 please click here (new tab). To view the DisabledGo access guide for WAT/F-WB2.48 please click here (new tab). To view the DisabledGo access guide for WAT/F-WB2.80 please click here (new tab). To view the DisabledGo access guide for WAT/F-WB2.81 please click here (new tab). To view the DisabledGo access guide for WAT/F-WB3.145 please click here (new tab). To view the DisabledGo access guide for WAT/F-WB3.146 please click here (new tab). To view the DisabledGo access guide for WAT/F-WB3.52 please click here (new tab). To view the DisabledGo access guide for WAT/F-WB4.174 please click here (new tab). To view the DisabledGo access guide for WAT/F-WB4.176 please click here (new tab). To view the DisabledGo access guide for WAT/F-WB4.63 please click here (new tab). To view the DisabledGo access guide for WAT/F-WB5.132 please click here (new tab). To view the DisabledGo access guide for WAT/F-WB5.144 please click here (new tab). To view the DisabledGo access guide for WAT/F-WB5.148 please click here (new tab). To view the DisabledGo access guide for WAT/F-WBG.70 please click here (new tab). To view the DisabledGo access guide for WAT/F-WBG.72 please click here (new tab). To view the DisabledGo access guide for WAT/F-WBG.73 please click here (new tab). To view the DisabledGo access guide for WAT/F-WBG.75 please click here (new tab). To view the DisabledGo access guide for WAT/F-WBG.79 please click here (new tab). To view the DisabledGo access guide for WAT/F-WBG.80 please click here (new tab). 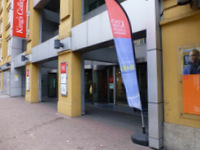 This venue is situated in the Waterloo Campus. The nearest National Rail station is Waterloo. The car park is located at the rear of the building, off Upper Ground. Please click here for more information on parking. The dimensions of the standard marked parking bays are 200cm x 500cm (6ft 7in x 16ft 5in). 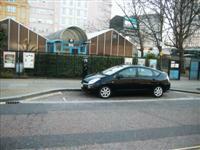 Standard marked parking bays are located on Upper Ground and Cromwell Road. This information is for the entrance located on Stamford Street. 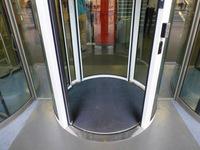 The accessible entrance is of a 'circle lock' design: The push pad is to the right of the door and is 110cm high. 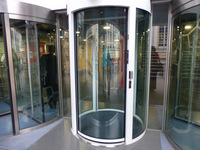 This opens the sliding door into the glass-walled cylindrical enclosure which is 138cm diameter internally. 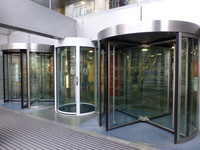 Once inside, the outer door closes automatically and the second door opens automatically. To exit the building, there is a similar push pad internally. 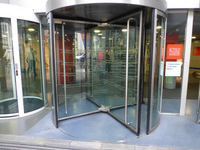 On each side of the circle lock entrance is a manual revolving door, 115 wide. 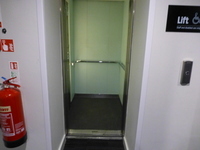 There is also a single, heavy manual door which opens towards you (pull) and is 95cm wide. 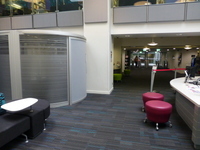 This entrance gives access to the security desk and opens onto a mezzanine level from which there is level access by lift to the ground floor of the building. 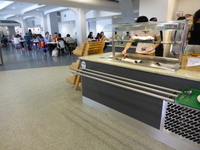 The desk/counter is 7m (7yd 1ft) from the main entrance. 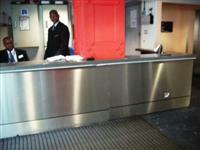 The security desk is located on the mezzanine level, to the left of the main entrance as you enter. It is staffed 24 hours a day. You are on Other Floors (Main Entrance Stairs). Skip to the next section. 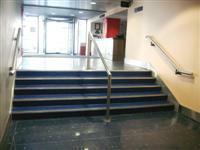 The floors which are accessible by stairs are the main entrance on the mezzanine level (M) to the ground floor. The stairs are located ahead after the main entrance. 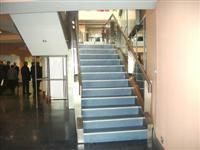 The stairs are approximately 10m from the main entrance. There are 5 steps between floors. From the ground floor, there are a further flight of 15+ similar stairs up to the first floor, as seen in photograph 2. The lift is located to the left, just past the security desk. 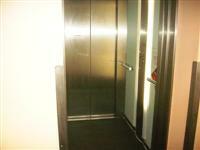 The floors which are accessible by this lift are G, M, 1. 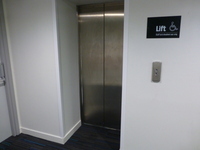 The dimensions of the lift are 95cm x 130cm (3ft 1in x 4ft 3in). The main entrance is on level M (Mezzanine). 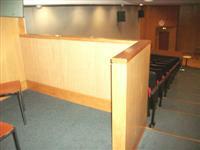 Photograph 2 shows one of the designated areas for wheelchair users at the rear of the auditorium. The lift is approximately 37m (40yd 1ft) from the main entrance lift. The clear door width is 109cm (3ft 7in). 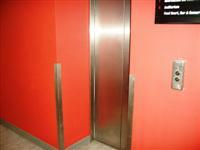 The dimensions of the lift are 133cm x 180cm (4ft 4in x 5ft 11in). 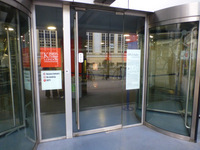 There is a similar lift (shown in photograph 2) located further along the corridor past the main lifts. 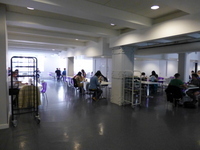 It gives access directly to the ISC on the first and second floors. A key is required to use this lift. 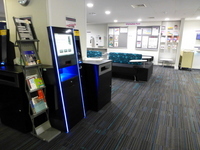 You are on Library (Library Services). Skip to the next section. This library does not have a regular supply of books in audio format. 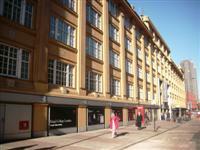 The library is located on the first and second floors. 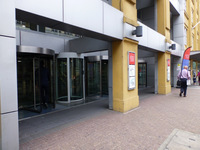 The entrance is on the first floor, to the right on leaving the main entrance lift. 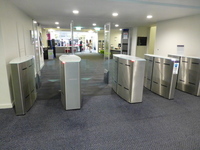 There are security barriers at the library entrance. The wide barriers are 90cm. 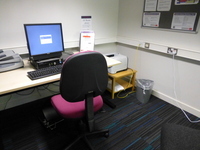 There are three assistive technology rooms on the second floor (see photograph 2). 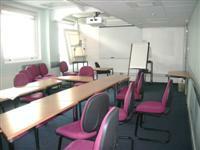 These rooms can be booked by registered users. The computers here have Dragon Naturally Speaking, Texthelp Read and Write, Inspiration, ABBYY FineReader and Supernova installed. 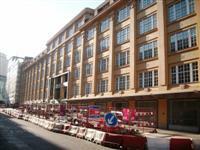 Please see the link in the introduction for details of library opening hours. You are on Reception (Library Reception). Skip to the next section. 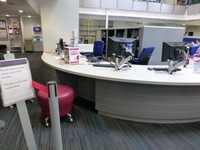 The desk/counter is 15m (16yd 1ft) from the library entrance on the first floor. You are on Other Floors (Library Stairs). Skip to the next section. 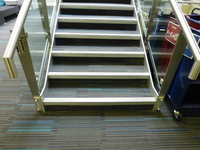 The floors which are accessible by stairs are library 1-2. 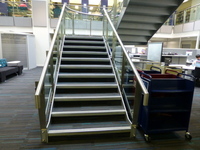 These stairs are located within the library, beyond the reception desk. The lift is located to the left of the library. 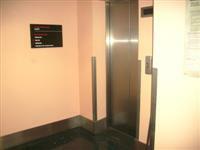 The lift is approximately 30m (32yd 2ft) from the library entrance. You are on Restaurant Bar Internal (Café Bar). Skip to the next section. 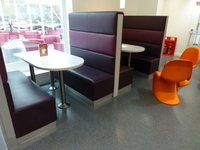 The nearest table is 28m (30yd 1ft) from the main entrance lift. 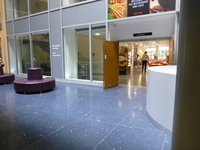 The café bar is located on the left of the ground floor. 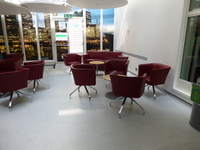 There is additional seating with armchairs and coffee tables in the conservatory. You are on Restaurant Bar Internal (Le Cafe). Skip to the next section. 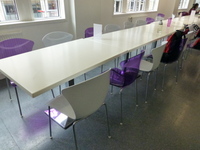 The nearest table is 15m (16yd 1ft) from the main entrance lift. Le Cafe is located on the first floor. 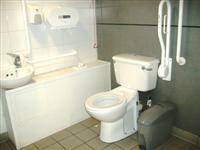 This accessible toilet is approximately 68m (74yd 1ft) from the main entrance lift. This accessible toilet is located at the rear of the ground floor, to the right. The dimensions of the accessible toilet are 174cm x 230cm (5ft 9in x 7ft 7in). The height of the towel dispenser is 140cm (4ft 7in). There is also an adapted toilet available in the far right hand corner of the ground floor, with the transfer space on the right. Both toilets on the first floor have the transfer space on the right. 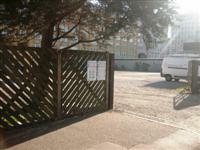 The female and male toilet facilities that were surveyed are located at the rear of the ground floor, to the left. The female and male toilets are approximately 53m (57yd 2ft) from the main entrance lift. Baby change facilities are located in the male and female ground floor toilets. These toilets contain cubicles with doors that open outwards. There are also toilets located in the far right of the ground floor, and on all other floors. 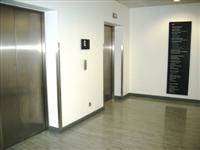 There are showers available on all floors and are accessed by deep steps.